Marnee Shay is an Aboriginal educator and researcher who is passionate about social justice, equity and community-driven research. Marnee’s maternal connections are to Wagiman country (Northern Territory) and she also has strong connections to Aboriginal communities in south east Queensland where she was raised. Marnee is an experienced secondary school teacher in flexischools – that offer a flexible curriculum for marginalised students – and has worked in diverse community school and TAFE settings with disenfranchised young people. Her academic teaching for pre-service teachers has included programs on Indigenous education and how to create positive learning environments for students. 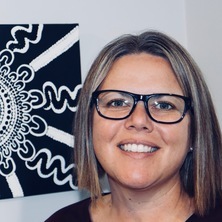 Marnee is a qualitative researcher who works with Indigenous peoples across urban, regional and remote communities, particularly in diverse school settings. She has developed a number of collaborative ‘yarning’ (story-telling) and creative methodologies for undertaking ethical research in Indigenous communities. This research has led to culturally and contextually relevant outputs developed by Indigenous young people including clothing items and text that creates voices on identity, health and wellbeing. Her research findings have resulted in school-wide reviews and changes to the way Indigenous education is undertaken, ensuring both suitability and sustainability of programs. Additionally, as a consultant, Marnee helps with genuine inclusion of Indigenous people and communities within schools, thereby building the capacity of the educators implementing Indigenous education strategies within the school environment. She also assists schools to develop relevant, collaborative and highly contextualised professional development programs relating to Indigenous education. Shay, Marnee and Lampert, Jo (2018, June 14). How flexischools could help close the gap in Indigenous education. The Conversation, . Shay, Marnee (2018). Leadership in Flexi schools: issues of race and racism in Australia. In Martin Mills and Gillean McCluskey (Ed. ), International perspectives on alternative education (pp. 131-142) London: Trentham Books. Shay, Marnee (2018). More than cultural celebrations Indigenous identities in school settings. In Tania Ferfolja, Criss Jones Diaz and Jacqueline Ullman (Ed. ), Understanding sociological theory for educational research 2nd ed. (pp. 102-115) Singapore: Cambridge University Press. Morgan, Ann, Shay, Marnee and Proud, Denise (2017). Inclusion in the middle years: supporting ethnic and cultural diversity. In Beth Saggers (Ed. ), Developing positive classroom environments: strategies for nurturing adolescent learning (pp. 278-294) Crows Nest, NSW, Australia: Allen & Unwin. Shay, Marnee (2017). Our mob are researchers too! The story of an Aboriginal researcher seeking new paradigms. In Chris McMaster, Caterina Murphy, Ben Whitburn and Inger Mewburn (Ed. ), Postgraduate study in Australia: surviving and succeeding (pp. 127-136) New York, NY, United States: Peter Lang Publishing. Shay, Marnee (2015). The perceptions that shape us: strengthening Indigenous young people's cultural identity in flexi school settings. In Tania Ferfolja, Criss Jones Díaz and Jacqueline Ullman (Ed. ), Understanding sociological theory for educational practices (pp. 93-109) Port Melbourne, VIC Australia: Cambridge University Press. Shay, Marnee (2018) Teaching notes for Growing Up Aboriginal in Australia. Carlton, VIC, Australia, Black Inc.
Shay, Marnee and Heck, D. (2013) Developing shared practice to support Aboriginal and Torres Strait Islander student retention in teacher education. Journal of Indigenous Australian Issues, 16 4: 42-57. Shay, Marnee and Sarra, Grace (2018). Our stories, our way: cultural identities, health and well-being of Indigenous young people in Australia. In: World Indigenous Research and Education Conference, Sámi University of Applied Sciences and World Indigenous Research Association, Norway, (). 22-24 August 2018. Shay, Marnee and Wickes, Judi (2016). Deficit constructions of Aboriginal identity in Australia: a CRT analysis of the pervasiveness in education across generations. In: 2nd International CERES Conference, Edinburgh, Scotland, (). 24-26 June 2016. Stuart, Kaz and Shay, Marnee (2016). Narrative participative action research to support social justice: methodological comparisons between Australia and the United Kingdom. In: Australian Association for Research in Education, Melbourne, VIC, Australia, (). 27 November - 1 December 2016. Shay, Marnee (2016). Seeking new paradigms in Aboriginal education research: methodological opportunities, challenges and aspirations. In: Australian Association for Research in Education, Melbourne, (). 27 November-1 December 2016. Shay, Marnee (2015). Aboriginal and Torres Strait Islander roles in flexi schools. In: Australian Association for Research in Education, Fremantle, Australia, (). 29 November-3 December 2015. Shay, Marnee, Morgan, Ann, Proud, Denise and Heck, Deborah (2014). Alternative notions of schooling in Australia: the story of teachers and principals engaging and reflecting on supporting Aboriginal and Torres Strait Islander students. In: World Indigenous Peoples Conference on Education, Honolulu, Hawaii, United States, (). 19-24 May 2014.